This wonderfully aromatic curry originates from the southern Indian state of Madras. Use in braises, sauces, marinades to create a unique and warm flavor. Adds a rich golden color to everything from soups and sauces to stews. Delicious with lamb, beef, chicken, and vegetables. 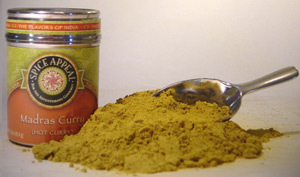 Mix 1 Tbsp Madras Curry with 1/2 tsp each salt and garlic powder for a spicy rub for grilling meat, poultry, or seafood. Goes well with Tofu dishes. Try a little in scrambled eggs and tomato dishes. This fragrant spice mixture contains coriander, cumin, cinnamon, cardamom, chili pepper, fenugreek, turmeric, and other spices.